This article is for travellers seeking compensation for delays, cancellations or discomfort during travel (e.g. broken air conditioning) for Trenitalia train tickets in Italy. If you aren't sure if your case is covered or need extra help, you can contact us at hello@loco2.com for further information. There are different processes and online forms for high-speed/intercity and regional trains. See the instructions for different train types below. Your "PNR code" is a 6-character reference that is used by the operator to identify your tickets. For "paperless" tickets, it is the same as your ticket reference. Regional trains don't have a 6-character PNR, but you'll find a longer ticket number on your print-at-home tickets. You can find this in your Loco2 booking confirmation email e.g. for Frecciarossa #9607 enter 9607. You'll need an IBAN and BIC/Swift code to receive a bank transfer directly from the rail operator if your claim is approved. You can usually find these on your bank statement but if you aren't sure, please contact your bank. If applicable, you should submit receipts for expenses in accordance with the Conditions of Carriage, e.g. alternative transport/taxi receipt, or a hotel bill if overnight accommodation was necessary. A photo/scan of these documents is acceptable, but we recommend retaining the original copies until your claim is resolved. If you are seeking reimbursement for non-refundable tickets due to the death of an immediate family member or serious illness of a traveller (requiring hospitalisation), you will be required to submit a death certificate or certified proof of hospitalisation. A photo/scan of these documents is acceptable. Claims for high-speed and intercity trains can be made via an online form. You should also use this process if you have a single ticket covering a high-speed/intercity train plus a regional train (if you have a separate print-at-home regional ticket you should use the regional trains claims process shown below). Type of purchase - select "Ticket"
Mode of purchase - select "Agency"
The customer used a credit card to buy? - select "No", even if you used a credit card to book the ticket on Loco2. Only customers who booked with Trenitalia direct should tick "Yes". Occasionally, the form fails to submit due to technical problems. In these cases, you should report the fault and submit the details of your claim to Trenitalia via the online claims assistance form . You can also submit a complaint directly to the rail operator. It is not usually possible for Loco2 to assist with claims on behalf of customers, but if you've exhausted all your options and still need help, get in touch and we'll do our best to assist. The Italian rail operator, Trenitalia, will review each claim and offer reimbursement in accordance with the Conditions of Carriage ( CIV rules). You should receive an automatic reply to confirm that your claim was submitted and expect a response regarding the specifics of your claim/reimbursement within 60 days. Approved payments will be made via bank transfer directly from the rail operator to the account specified by you on the claim form and a confirmation email will be sent by Trenitalia. Find the region you need in the list below so you know where to send the completed form - if you're not sure of the region, searching the internet for one of your journey's station names should help (Wikipedia shows the region for all major Italian towns). Personal information authorisation - Select "I authorise", and add the date and your signature. 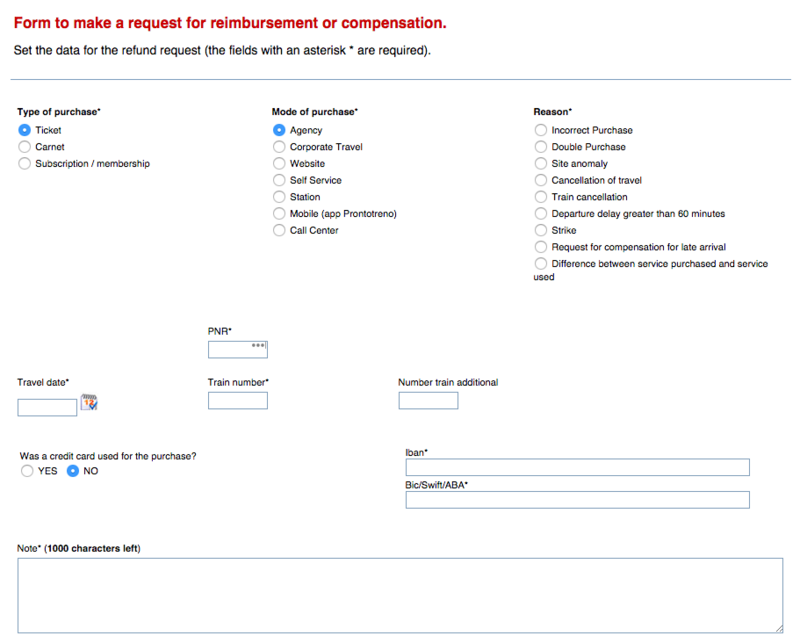 Type of request - Select the reason and your preferred refund method. Journey data including "Coupon number" - Enter the ticket code (the 9-digit number appearing on your ticket) under coupon no., alongside the train number (shown in your Loco2 confirmation email) and travel date. Personal and bank information - Provide your personal information and contact details as Trenitalia may request additional paperwork to accompany your claim. To receive your refund, enter your IBAN and SWIFT/BIC code of the bank account into which you would like to receive approved compensation. If you aren't sure of these, please contact your bank. You can include additional information in a cover letter but note that staff the regional offices don't have multi-language staff. Therefore, additional information should be submitted in Italian. We recommend using an online translation tool.